That's なつかしい in the heading, meaning "nostalgic." 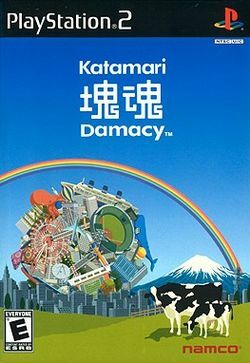 The "Recommended for You" section of my YouTube page recently suggested a piece from Katamari Damacy, an odd gem of a game released back in 2004. Actually, our own resident Shadow gave it to me as a gift. I believe it sat unopened for a few weeks (sorry, man) before I decided to give it a whirl, and boy was I glad I did. Katamari Damacy is a, quite simply, a game that involves rolling up things into a ball. It's kind of like those games where you start off as a germ or a little fish, and as you eat more you get bigger and can eat bigger things. Except in this game you roll of things so you can roll up bigger things. And man, the things you can roll: coins, food, animals, people, eventually buildings, clouds, continents, worlds...I know it sounds strange, and it is. But it is damn fun. And the soundtrack really floored me. Weird, like the gameplay, but also well-done and very catchy. In fact, I just hunted it down and bought it on Amazon Japan. Wow, what a consumer whore I am. I am a product of my environment! Damn you, YouTube!